There is nothing like a good injury to talk some sense into a stressed out workaholic like me. The reason I wasn't blogging for the past couple of days is because I hurt my back and spent the last couple of days either standing or lying down. Neither one of these positions is particularly conducive to typing, though I did try using a laptop while lying down with my legs propped up. It worked long enough for me to send an e-mail to The Seasonal Cook asking for a cranberry vodka recipe and to post a restaurant review on chowhound. Then I finally had to give up. My husband complains that I am terrible at being sick -- I never give up and only make myself worse. I have been trying to do way too much lately. It's a long story that I'll save for another time when I am more comfortable sitting. But while I was lying in bed, frustrated at my immobility, I had a chance to do some thinking and put the crazy project that was stressing me out on the back burner. Since most of my back troubles were due to stress and endless hours spent in front of the computer, I am feeling better already. Luckily, cooking does not require sitting -- or at least that was my excuse for making some latkes last night. I love the holidays. That's when our food reflects our origin. The rest of the year, I much prefer Mediterranean to Russian -- it's more vibrant, colorful, and healthy. But couple of times a year, I am drawn to the starchy, mushroomy, and earthy tones of eastern european food. I love the pungent smell of onion in the latkes batter, the sizzle of oil in the pan, the edges of each latke turning crisp and golden as the air becomes infused with starchy goodness. There is no such thing as latkes leftover. They always get eaten, "inhaled" more like it, so I had to make sure not to make too many. Just enough to make it feel like Hanukkah. No more sitting. My back says I should go and cook something. I have some dry mushrooms soaking for a mushroom soup that I'll have to tell you about next week. 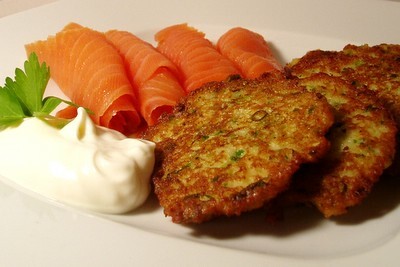 To save myself more typing, I'll just link to the Latkes recipe on my other site. I'm so sorry you hurt yourself, and hope you feel better soon. I plan to make the salmon orange pate over the holidays!